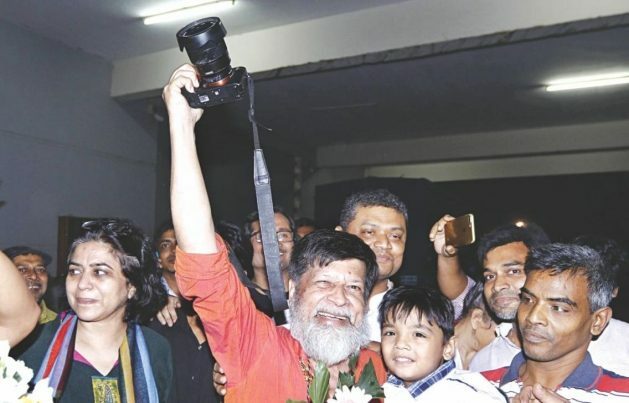 Nov 21 2018 - After 107 days in jail, acclaimed photographer Shahidul Alam was finally released last night, five days after he had secured permanent bail from the High Court. He walked out of Dhaka Central Jail in Keraniganj around 8:20pm, following a daylong confusion over his release. Shahidul hugged his wife Rahnuma Ahmed who, along with their relatives, his students, well-wishers and lawyers, had been waiting at the jail gate since 11:00am. He raised his fist in the air as they welcomed him with bouquets. A smiling Shahidul then thanked all those who spoke for his freedom at home and abroad. His lawyers said the release order reached jail authorities around 11:30am. However, around 2:30pm, the authorities said the address on the document did not match with that on the jail documents. They then sent the order back to a Dhaka court for correction. The corrected copy came back around 5:55pm, they said. Talking to The Daily Star, Rahnuma said a jail official called them over phone around 7:30pm and said her husband would not be released. The official told them to come again around 10:00am today. However, the official again called them around 8:00pm and told them to go near the jail gate. By that time, many of those waiting outside had left, she said. Shahidul came out around 20 minutes later. Rahnuma also said both the addresses were correct. One was the present address while other was the permanent one. Senior Superintendent of Dhaka Central Jail Iqbal Kabir Chowdhury said they received the release order from a Dhaka court yesterday morning, but could not let Shahidul go as the order had “some mistakes”. Shahidul, also the founder of Drik Gallery and Pathshala South Asian Media Institute, was picked up on August 5 from his Dhanmondi home in the capital during a widespread demonstration for safe roads. Police filed a case against the 63-year-old under section 57 of the ICT Act and produced him before a Dhaka court the following day. He was then placed on a seven-day remand. Police charged him with “spreading propaganda and false information against the government”. His arrest and imprisonment sparked outrage and condemnation at home and abroad. The noted photographer obtained permanent bail from the High Court on November 15 following a petition by him. On Monday, the government filed a petition with the Supreme Court seeking a stay on the High Court verdict that granted him permanent bail. Meanwhile, in response to Shahidul’s release, Saad Hammadi, Amnesty International’s Regional Campaigner for South Asia, in a statement, said, “Shahidul Alam is a bold representation of Bangladesh through his lens. He should not have been detained in the first place. “Bangladesh authorities must immediately drop charges against Shahidul Alam and uphold its international commitments to protect the right to freedom of expression,” he added.